We are what we remember. But imagine, suddenly, that you were confronted with incontrovertible evidence that what you remember is wrong. That, in fact, you behaved in a very different way than you remember at a key point in your past. Would it change your sense of identity, or alter your understanding of the world? This is the central theme in The Sense of an Ending by Julian Barnes, more of a novella than a novel at around 150 pages, which was recently long-listed for the Man Booker Prize. The protagonist of The Sense of an Ending is Tony Webster, now retired and divorced, living a quiet, satisfactory, largely uneventful life and reasonably content with his lot. Out of the blue he receives a surprising bequest from the recently deceased mother of an ex-girlfriend from his student days, someone he has not seen for many years. As he puzzles over why he has been remembered, he recalls events and friendships from his student days. But it soon becomes apparent that others have very different memories of those times and their consequences than he does, and there is hard evidence to suggest that Tony’s recollections are wrong. Gradually in the course of the book the layers of the past are peeled away to reveal a truth which shakes Tony’s belief in himself. Julian Barnes is one of our leading novelists and The Sense of an Ending shows him working at a very high level. It is beautifully written and always interesting, while striving to address serious themes. At the core of this is the unease produced by the idea that Tony has lived an entire life built on a self-image relying on false memories. Is this because memory is inherently unreliable, or because some of us have the ability to reimagine events to be different than they really were, enabling us to live a different type of life than the one that our behaviour warrants? Barnes does not answer these questions, but makes the reader think about them. 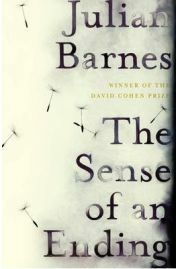 The Sense of an Ending is a very worthy book which should enhance Barnes’ reputation. However, I doubt if it will win the Man Booker prize this year. It is probably not a substantial enough novel to justify the accolade, but it is well worth reading. I suspect that the theme and perspective will appeal more to older readers, though the ideas involved should be relevant to all. 5 Comments on "The Sense of an Ending"
Well, Barnes has made it to the shortlist (I think he’s the biggest name on it). I just finished this and I have to say I thought it was absolutely awful. I’m now rather nervous because I have the rest of the Booker short list to read and if this dreadful rambling rubbish WON, I fear for the standard of the others. I’ve read several Julian Barnes novels and I should stop and read no more – they’re all very dull and dreary. It was certainly an interesting book, but not the one on the shortlist which I enjoyed most. The theme of the unreliabilty of memory was surprisingly common last year – The Stranger’s Child and There But For The spring to mind. It’s funny how a theme can crop up repeatedly in such a short period of time!